To make sure this casserole came out rich and satisfying but not overbearing, we chose leaner (but still flavorful) turkey sausage instead of pork and banned soggy bread by toasting torn baguette slices, enriching their flavor and ensuring they would stand up to the custard. To add even more depth to the pudding while further preventing a wet texture, we microwaved kale with some aromatics and oil to jump-start its cooking and eliminate excess water in our finished dish. We stirred the toasted bread into a simple custard, prepared with 3 parts cream to 2 parts milk for measured richness. To prevent curdling, we stabilized the custard by using just yolks rather than the traditional whole eggs. 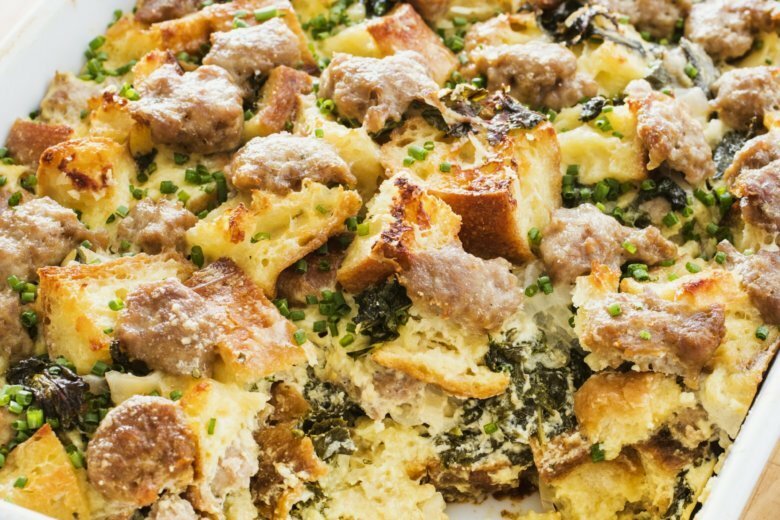 Once the bread had absorbed some of the custard and the kale was mixed in, we layered the custard-bread mixture with sausage and topped it all off with Parmesan. From there, all we had to do was bake it, covered at first to set the filling and then uncovered for the last 20 minutes to generate some appealing browning. Adjust oven rack to middle position and heat oven to 450 F. Arrange bread in even layer in 13-by-9 inch baking dish. Bake, stirring occasionally, until bread is crisp and browned, about 12 minutes; let cool for 10 minutes. Reduce oven temperature to 400 F.
Meanwhile, combine kale, shallots, garlic, and oil in bowl and microwave, stirring occasionally, until kale is wilted, about 5 minutes. Wrap kale mixture in clean dish towel and wring tightly to squeeze out as much liquid as possible. Whisk cream, milk, egg yolks, and mustard together in large bowl. Stir in toasted bread and drained kale mixture until well combined. Spray now-empty baking dish with vegetable oil spray. Pour half of bread mixture into prepared dish. Crumble half of sausage into 1/2 inch pieces over top. Top with remaining bread mixture and remaining sausage. Sprinkle with Parmesan. Cover tightly with greased aluminum foil and bake for 45 minutes. Uncover and continue to bake until custard is just set and top is browned, about 20 minutes. Remove dish from oven and let cool for 10 minutes. Sprinkle with chives before serving. Nutrition information per serving: 809 calories; 554 calories from fat; 62 g fat (34 g saturated; 1 g trans fats); 462 mg cholesterol; 657 mg sodium; 41 g carbohydrate; 5 g fiber; 12 g sugar; 27 g protein.